I posted the most during January and December of 2011. I posted the least in November. 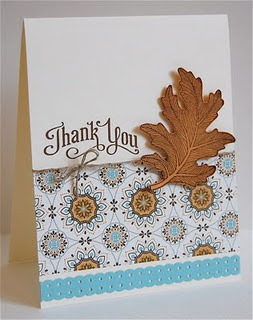 My most commented on post was The Outlawz Blog Hop post on October 3, 2011. 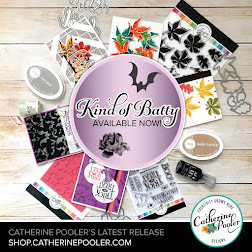 I was published four times in Paper Crafts Magazine (happy dance!). I'm looking forward to a creative 2012. I can't wait to see what the new year has in store for me!!! 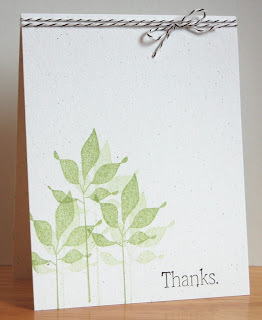 Thanks for taking the time to visit me here & for leaving me wonderful comments that make keeping this blog worth it! I thought I'd take a look back at my favorite cards from 2011. Stop by tomorrow for the second half of my "Best of 2011". I hope you had a wonderful holiday, we sure did. It's hard to believe with all of the preparations that it comes and goes SO quickly!!! This week's challenge is to celebrate the birth of a new life. Make a CAS baby card to honor this wonderful miracle. 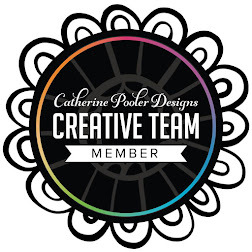 Head on over to join us, I'd love to see you play along!! Wishing you a very Merry Christmas & a Happy New Year!! Isn't this tree so fun? It looks like it would take a lot of work, but it literally took minutes! I kid you not!!! This is yet another project inspired by StampNation!! The reasons to join are endless. Click here to learn more! A little inspiration for you today!!! 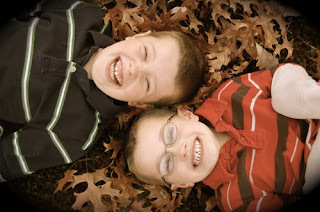 The above is photo is our inspiration challenge at The Outlawz this week! 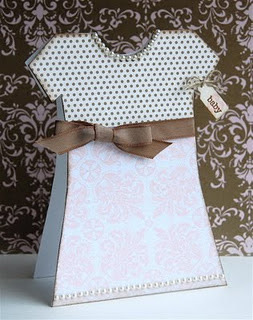 As soon as I saw the inspiration piece I knew exactly what I wanted to do for my sample! Little mittens hung on a snowy mantle :) I know you don't usually find a snowy mantle, but just go with it! 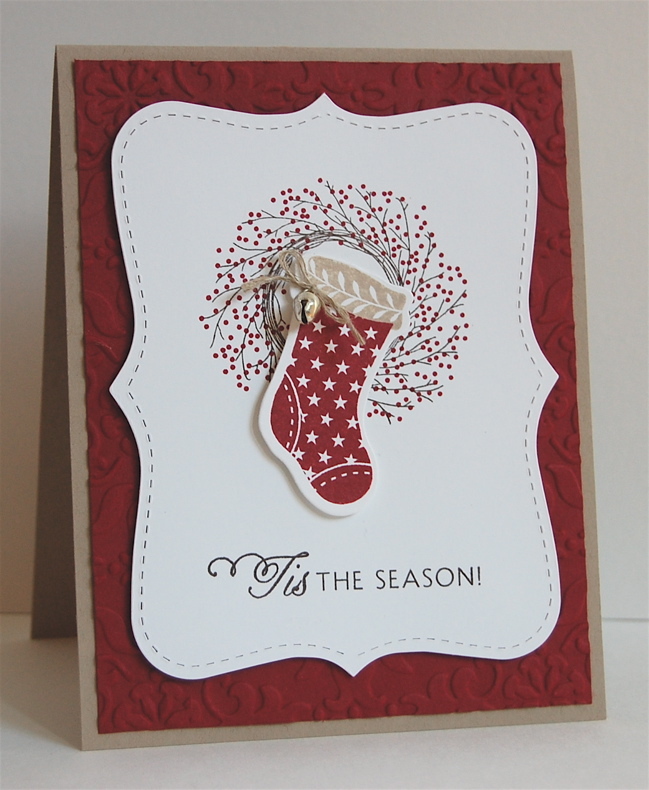 I started by replicating the idea of a mantle using my Top Note die, dsp, some greens from Christmas Lodge and Mica Flakes. 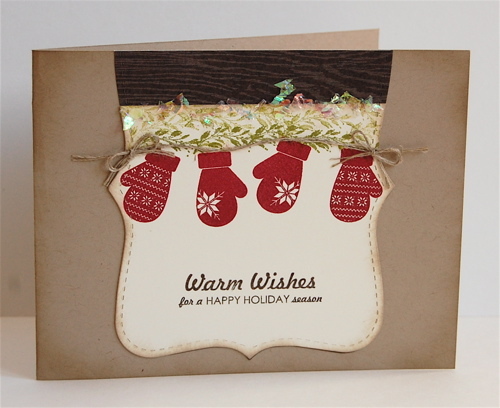 Then I stamped the mitten images from Warm Wishes and adhered Linen Thread as if the mittens were actually hung. Cute, right?! 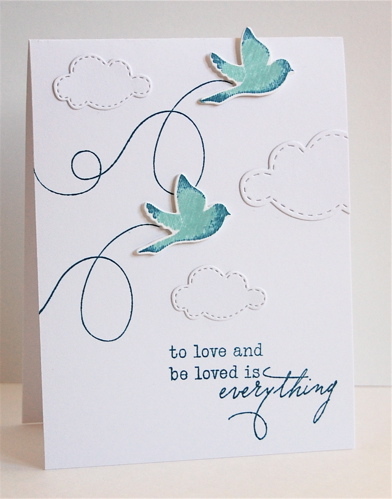 I finished this CAS card with the perfect sentiment and some distressing. 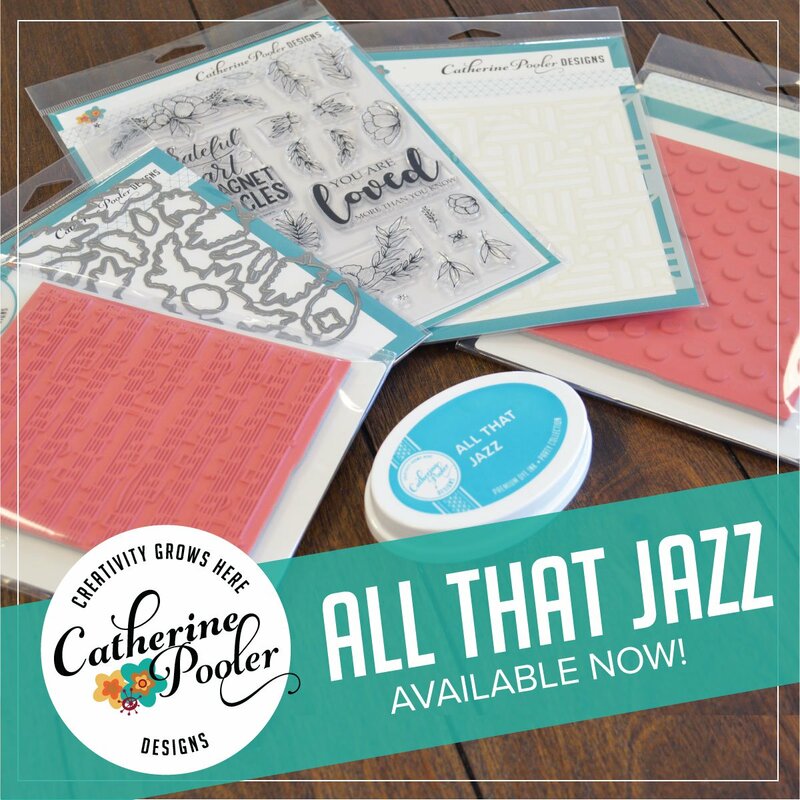 If you get a minute to stamp, head on over to The Outlawz and play along. As always, we have fabulous sponsors and new challenges posted daily!!! 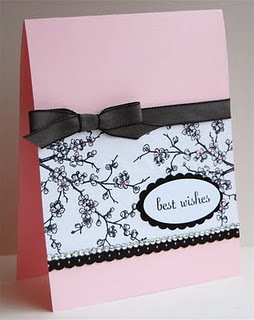 ***This is my second post today, scroll down to see my One Layer Card. but this one especially spoke to me. Here's how I interpreted the inspiration piece. 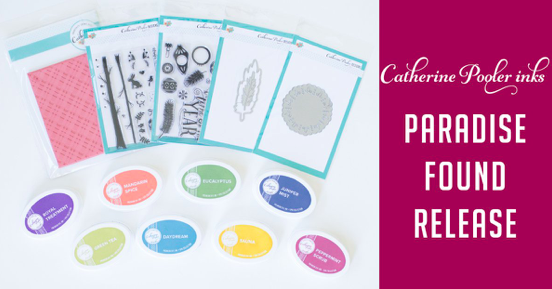 Thanks for the inspiration Cath!! Today, I decided to take a break!!! I baked this morning and then gave myself a bit of time in my stamp room before I need to get showered and go!!! I was actually surprised that I was able to come up with anything at all!! 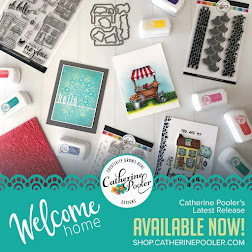 It feels like forever since I stamped, just to stamp!!! 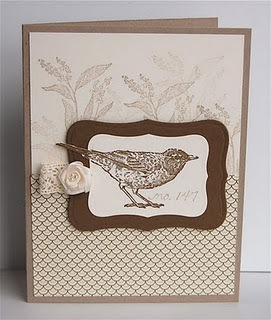 I was inspired by the One Layer Wednesday challenge...a card that says peace. I chose this image because I love the calm quiet of nature. ps-I never noticed how often I use exclamation points, it's a bit excessive today huh? My Mom asked me to make a Christmas card for her sister (my Aunt). She didn't give me any ideas or guidelines, she just gave me free reign to create. I love that!!! 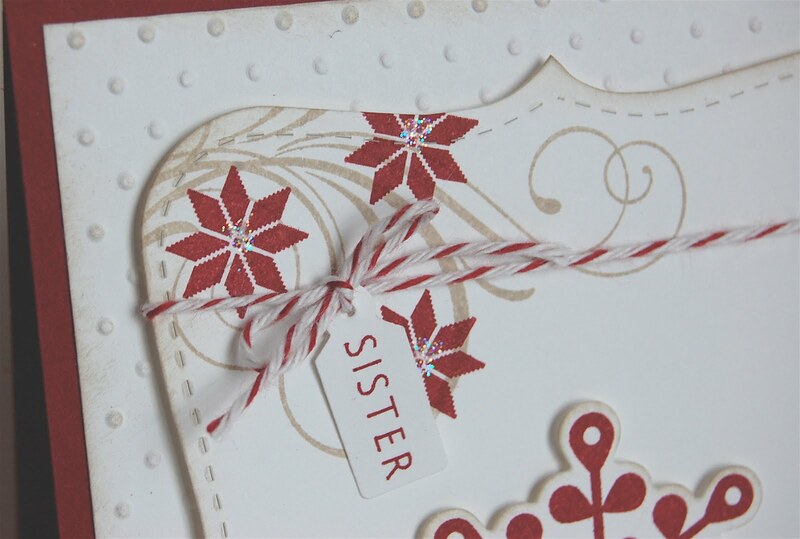 My Aunt is a girly girl and I was close to making a non-traditional Christmas card with pink as the focal color, but somehow I wound up with this? It's funny how that happens sometimes, right?! I combined quite a few sets here...PTI Peace Be Still, Stocking Prints, Fancy Flourishes & wplus9 Fair Isle Backgrounds. 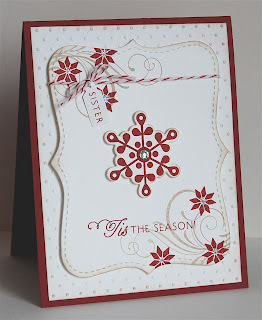 I love the flourishes in Crumb Cake with pops of red that look like poinsettias. I added a bit of bling (what girly girl doesn't love bling) to the snowflake and Dazzling Diamonds to the center of the Fair Isle images. 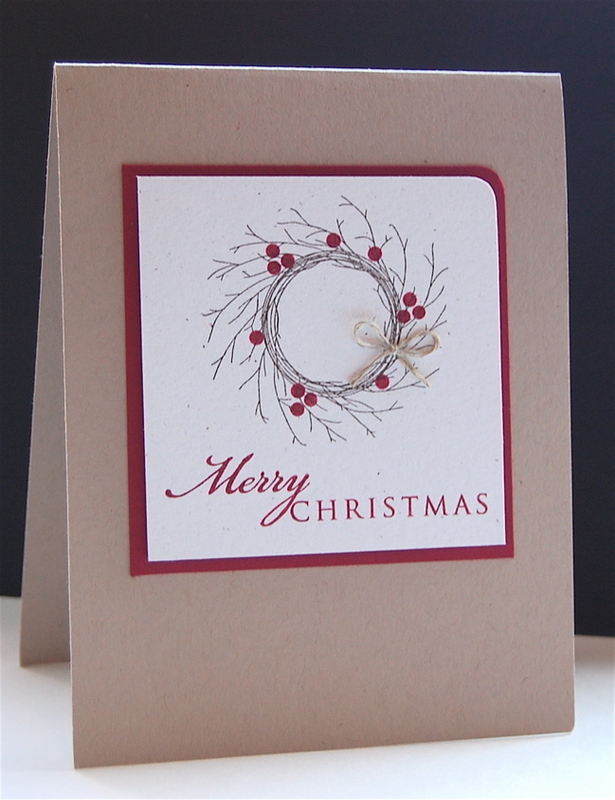 I also added some sponging to the edges of the Top Note and embossed background. 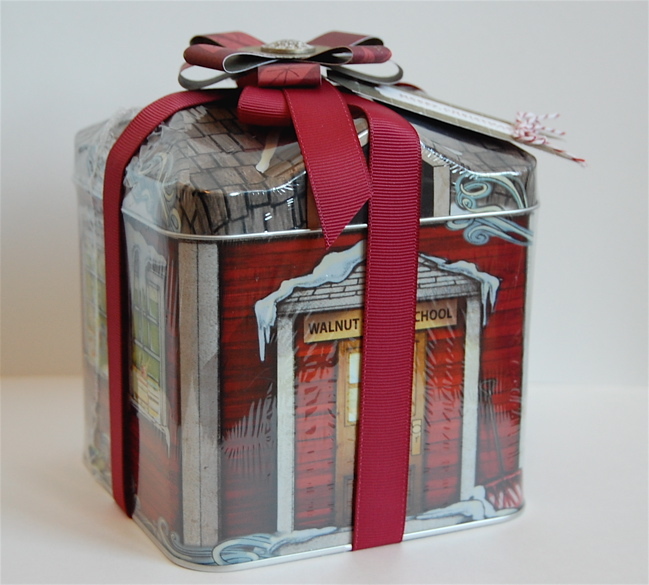 I purchased this adorable tin of chocolate covered pretzels for my sons teacher for Christmas. 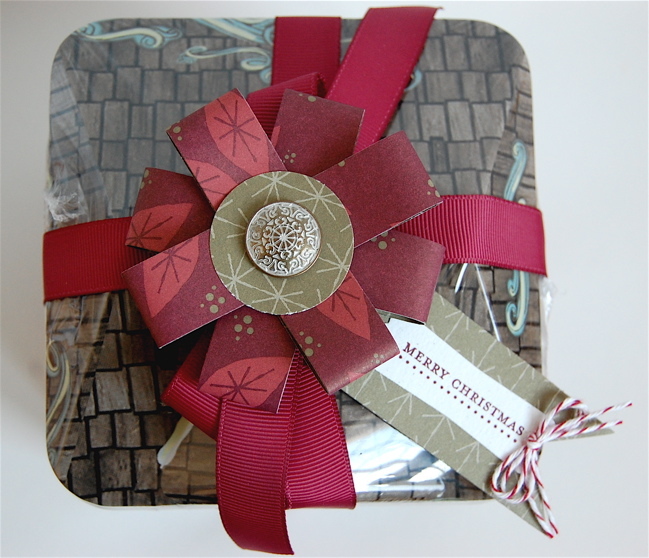 The tin is too cute to cover with wrapping paper or to put it a bag, so I dressed it up a bit to make it ready to deliver. 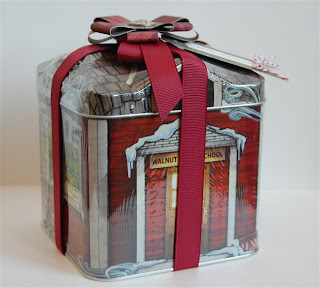 I started with a long length of 3/8 inch grosgrain ribbon which I tied in a big bow at the top of the tin. Then, using 3/4 inch x 6 inch pieces of dsp, I made a cute flower/bow, a technique I learned from StampNation. I also made a tag with the same paper which I tied around the bow with Linen Thread. So quick and easy and really dresses up this gift perfectly!!! My list of things to do right now is SO long that I don't have room to add anything else to it! 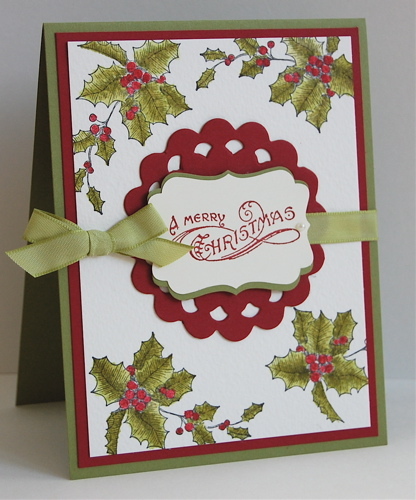 I worked all day on my Christmas cards today, just the insides!!! 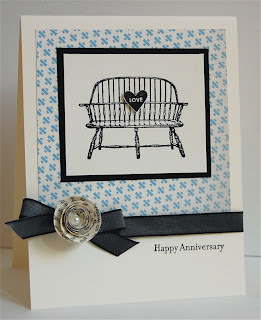 **Note to self- start completing cards inside & out!!!! Since this took all day, I didn't even get to check anything off of my list, ugh!!! 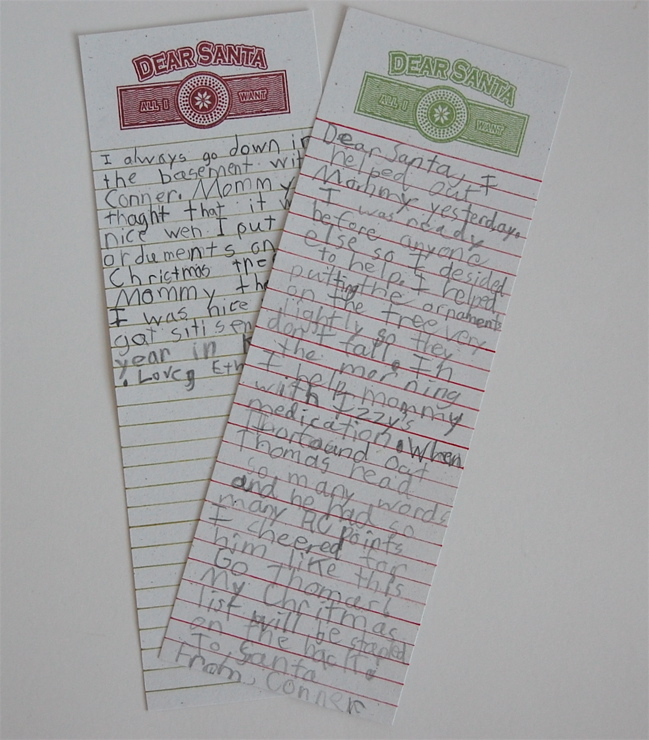 One thing checked off yesterday was writing letters to Santa. 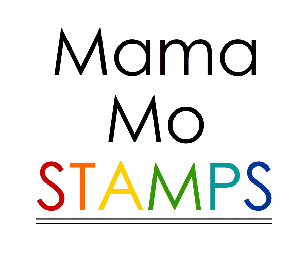 I won this cute stamp set a few months ago from wPlus9 and had fun making these for the kids to send to Santa. I kept them very simple, just the stamp and drew lines every 1/4 with markers. I always have the kids write a letter saying good things they did during the year. They come up with the cutest things!!!! That's all for now. 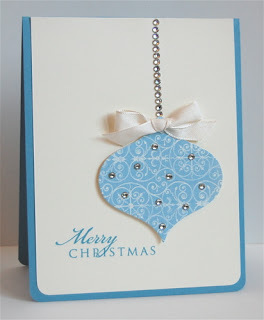 I'll try to pop back in tomorrow with an adorable tin I embellished! 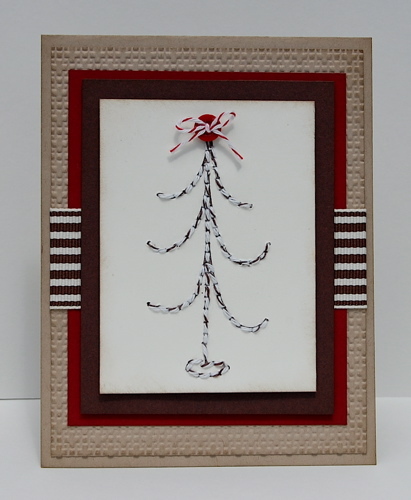 I mentioned last month that I am making layouts to display in my house seasonally and for holidays. 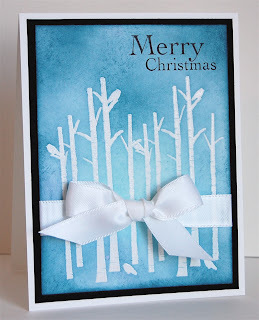 This is my December layout...I came across this adorable photo recently and had to scrap it. 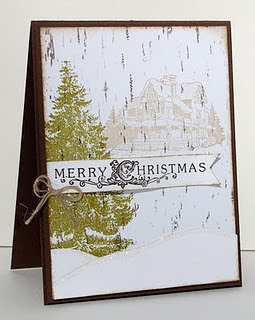 I stamped the background paper using Always Artichoke ink with the Bells & Boughs stamp set on Naturals White Cardstock. Then I used my aquapainter to fill in the holly berries with Cherry Cobbler ink. I also used one of the self adhesive die cut strips from the Christmas Lane Simply Scrapping kit. I added some Basic Pearls to it to make it pop a bit more! 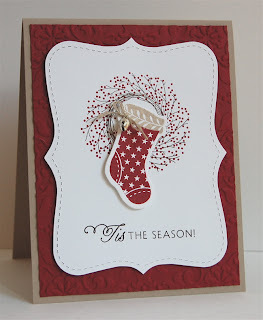 The stockings (Stocking Prints-PTI) were die cut and stamped in the same colors. 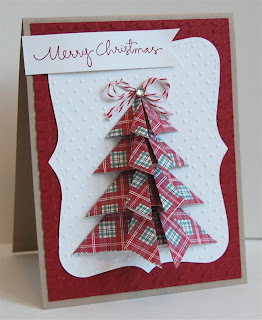 I decided to step away from holiday cards again, just for today, to play along with the CAS challenge at SCS. The challenge is to be inspired by the phrase "Chill out!". 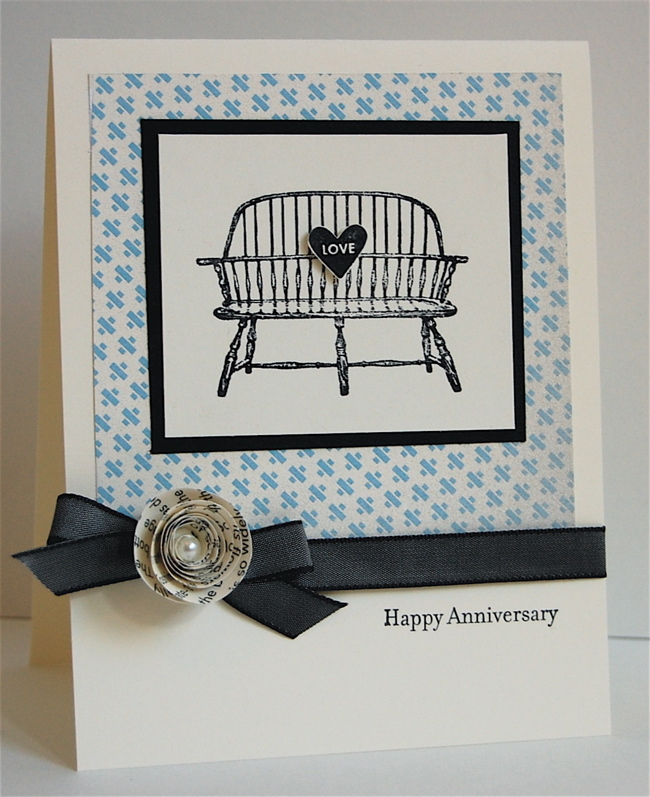 I have many ideas brewing on this one, but my first thought was to make a card using "Have a Seat". I often tell my kids to sit down and chill, so that's where my thinking came from. 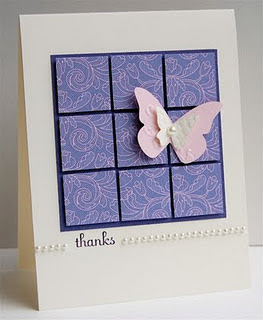 Sunday's here on my blog mean a new CAS challenge at The Outlawz. 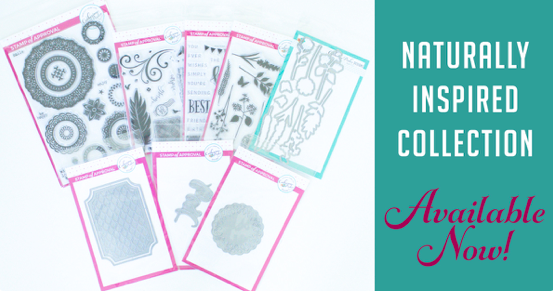 This week we are challenging you to use your glitter. Not just a little, but a lot!!!! 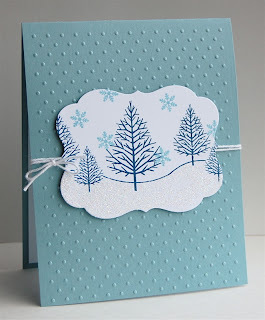 I started my card by stamping a winter scene. It kind of looks like my backyard right now! Then I took my 2 Way Glue Pen and filled in the entire area below my stand of trees and sprinkled Dazzling Diamonds all over it!!!! 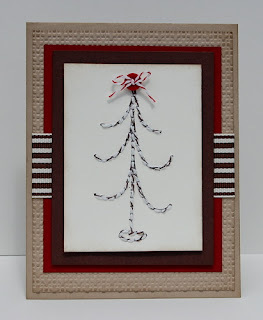 To finish off my card I tied some Cherry Cobbler Bakers Twine. Easy Peasy! Join us, I'd love to see you play along! 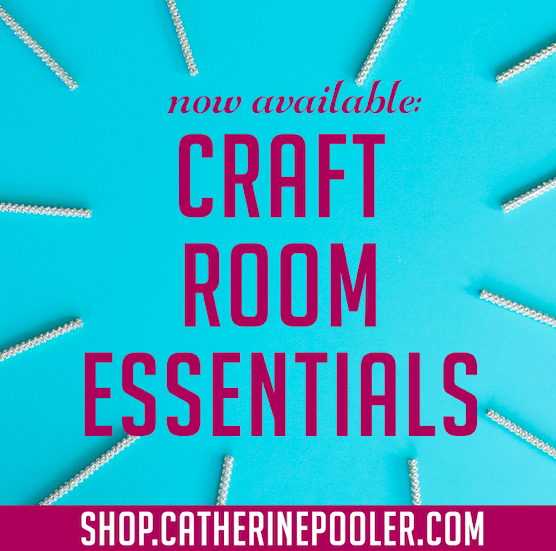 If you've followed me for a while, you might remember that at one time my blog was titled "For the Love of Buttons & Bows". I may have changed the name, but the love remains! The challenge in the Paper a la Mode group at The Outlawz is to use buttons, how could I pass that up? You should see what those gals have done with buttons, holy smokes!!!! They went above and beyond a card...trees, advent calendar, bird house... WOW! I wasn't quite sure where I was going with this one and to be honest, I don't love the outcome. Something with the layering just doesn't seem right to me? 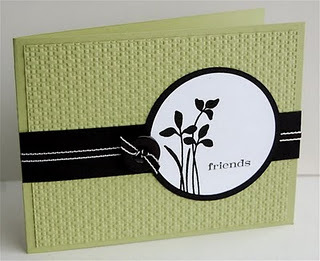 I love the classic color combo and the beautiful label, but I think it has something to do with the blank Cherry Cobbler space beneath the threaded buttons...any suggestions on how to improve this card? I'd love your input! No, I don't have the winter blues (yet), but admittedly, I am a bit cranky...my kids constant bickering, you know the he did this and he said that, back talk, whining, moaning, throwing sneakers, slamming doors, stomping...and that was just this morning, it's driving me crazy! And, I haven't stamped ALL week!!! I think I was going through withdrawal, so today, I decided to forget about the treadmill and the laundry, the cleaning and errands and I stamped. It felt good!!!!! I received my January/February issue of Paper Crafts Magazine yesterday and was inspired by the "Cure for the Winter Blues" section. 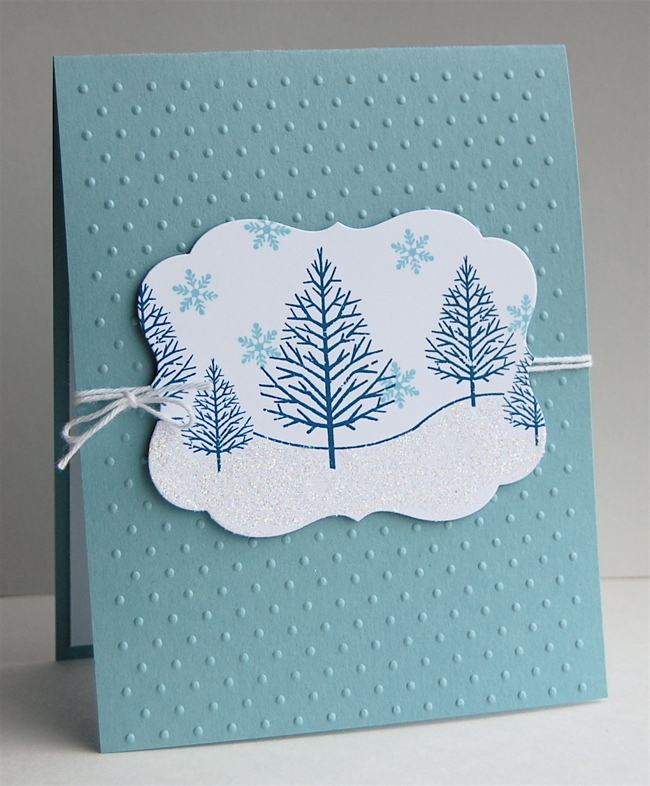 I thought I'd pull out some of my Ippity stamps and try to create a holiday card in blue, why not, right? I started by stamping the trees with Versamark ink and heat embossing them with clear embossing powder. Then, I used a sponge and Pool Party & Island Indigo ink and made the background. I used a tissue to wipe the ink off of the trees. I love how the trees pop! 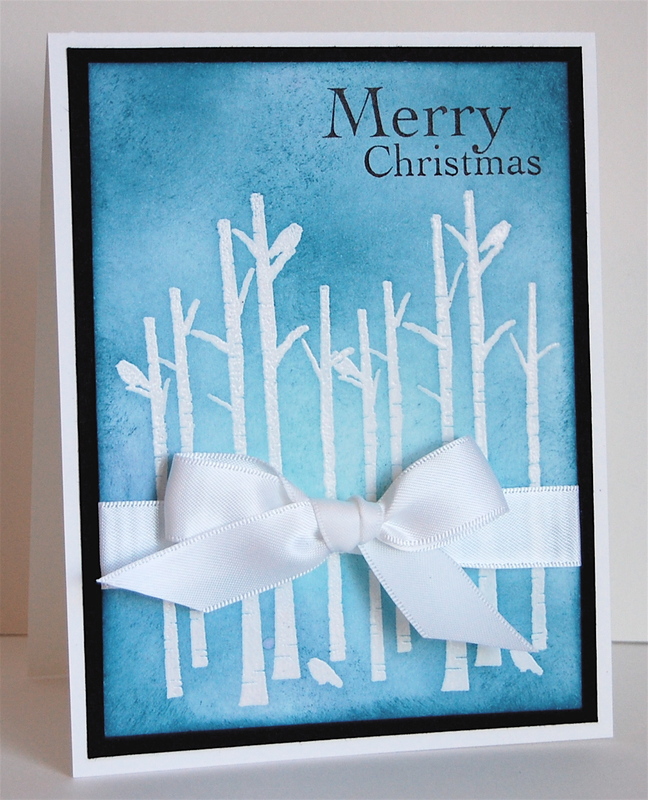 I didn't want to take away from the scene I created, so I simply stamped the sentiment and tied a bow at the bottom of the card. We woke up to a winter wonderland! 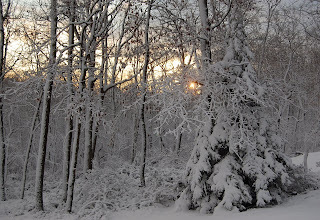 Enough snow to make it look magical, but not enough to be a nuisance. The kids had a delayed opening, so I took advantage of my time with them and we started to decorate the Christmas tree. 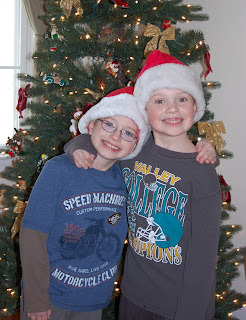 As a family tradition, the boys get an ornament every Christmas, just like I did (and still do from my Mom). 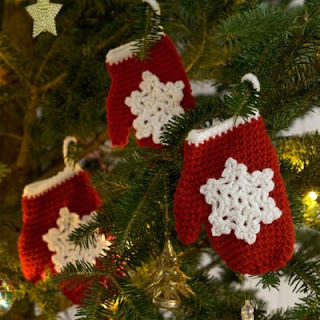 We line them up by year and hang them one at a time starting with the oldest ornaments. I love it!! It reminds me of sitting on the floor with my sister doing the exact same things. I don't line up my ornaments anymore though, geez, the kids would never get a chance to go!!! In one of the bins we found the kids Santa hats. They both wanted to wear them to school :) Their teacher let them wear them all day (I was surprised). Ethan said, a bit annoyed, "All of the kids were calling me Santa ALL day long!" huh, I wonder why, lol! I hope you liked my family post. It's been a while and well, I haven't had a chance to stamp all week. Hello! Happy hump day to you! I have one more Dasher card for you. I will be returning this fabulous set soon & had to play with it one last time! 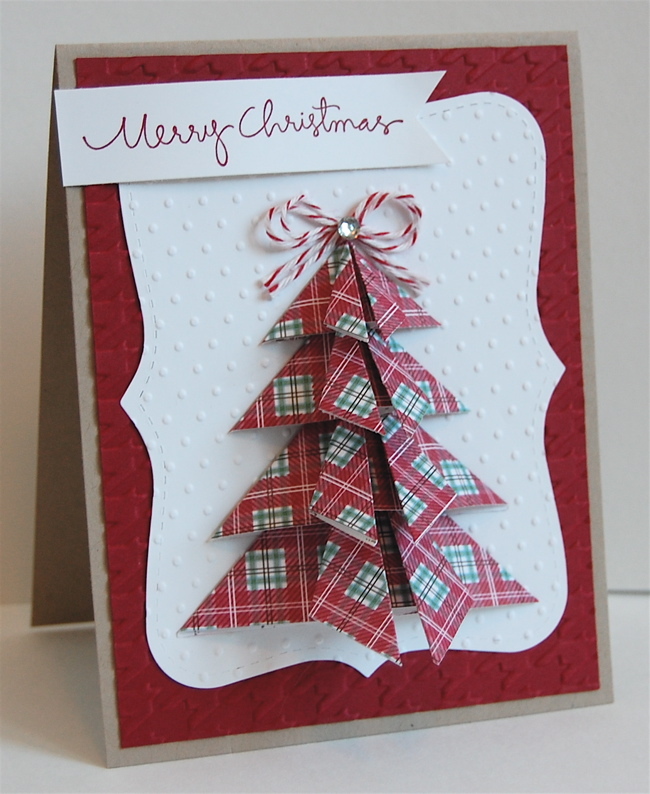 I kept the Card Patterns sketch (144) & the Splitcoast CAS Challenge (twine) in mind while I was creating this card. Another very CAS card for the holidays. I jazzed it up a bit by adding a few rhinestones to Dasher's antlers! 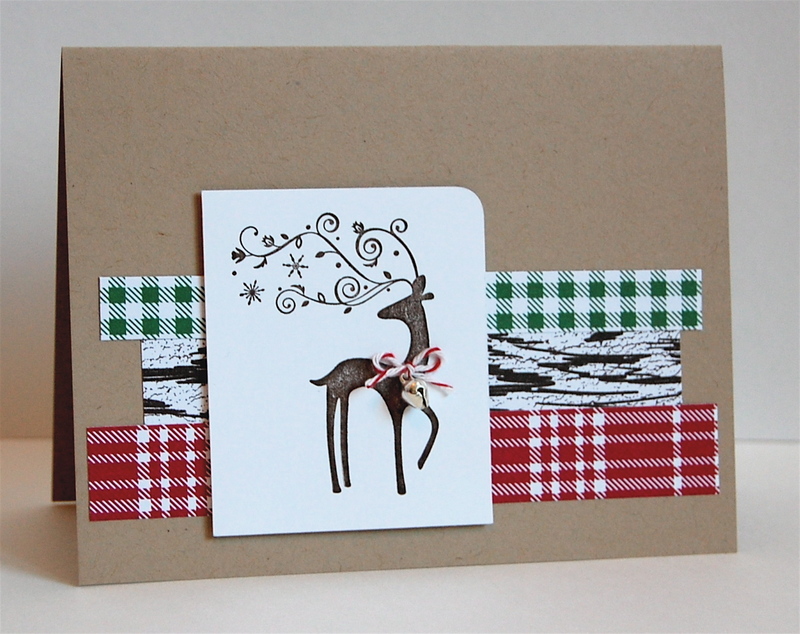 An observation I made the other day...every year I start making Christmas cards in September. By November I'm done, not actually finished, but bored of Christmas and longing for bright summer colors and flowers. For some odd reason, this year, I'm not. 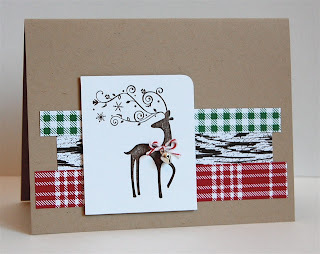 I keep thinking it will be time to switch gears soon and I think I'm going to miss the festive card making :( There are lots of Christmas card challenges that go throughout the year, so maybe I'll have to join in on them!!! 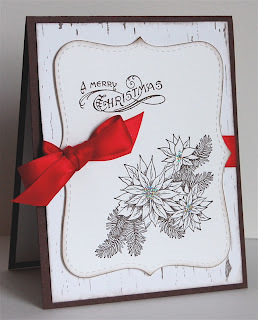 The newest challenge was just posted over at StampNation! The challenge, "Color it in! ", is definitely a challenge for me. 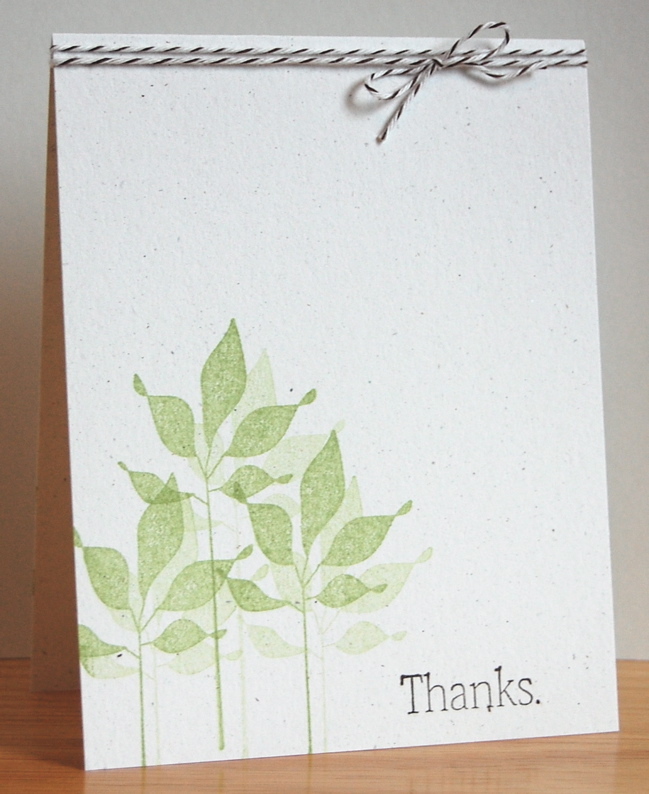 I usually stick to bold stamps, but have tried branching out a bit. I have really enjoyed watercoloring Bells & Boughs lately, so that's exactly what I did for my sample!!! Have you checked out StampNation yet? 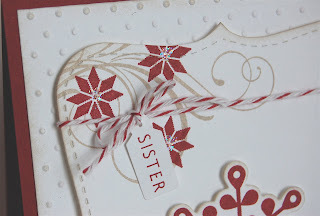 Did you see the sneak peek I posted last week? What are you waiting for? I hope to see you there! I wasn't exactly sure where to go with this challenge, because really, you could make anything. 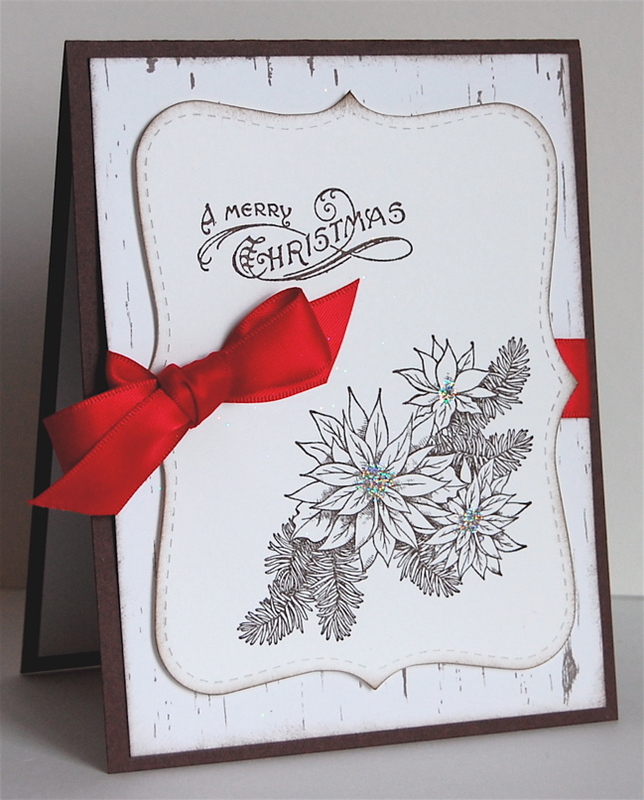 I decided to stray from Christmas cards for a bit and used my Happy Trails stamp set which has gotten a lot less attention than it deserves! I started by die cutting the clouds (Lil' Inker) and the birds that coordinate with the Happy Trails stamp set. Next, I stamped the bird image in Pool Party and then rolled it in Island Indigo (Rock & Roll technique). I arranged the clouds and birds then stamped the trails & sentiment. My birds acted as the marshmallows and were popped up on dimesionals. Join us in this fun challenge, I'd love to see how you interpret it!!! Have you stopped by The Outlawz lately? 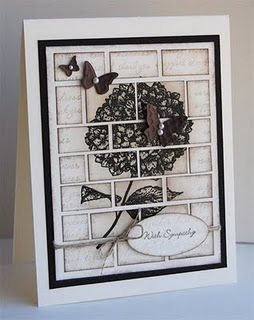 I'm playing along with the Saturday challenge in the Paper a la Mode group. The challenge today is to make an ornament or use an ornament on your card or layout. My friend, the same one that loaned me Dasher, just purchased the Spellbinder Ornaments which means I got to play with them too!! 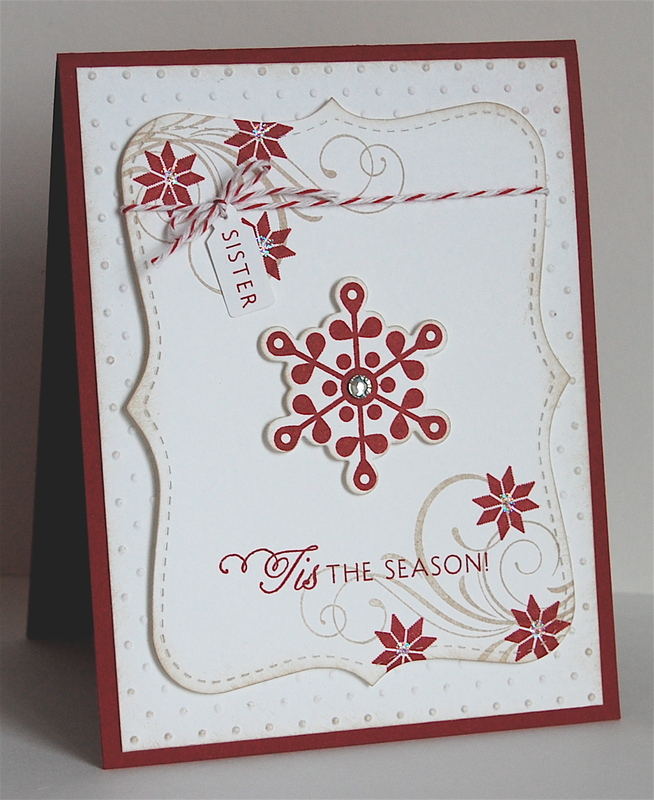 I used the medium sized die and cut a piece of the Beau Chateau dsp. 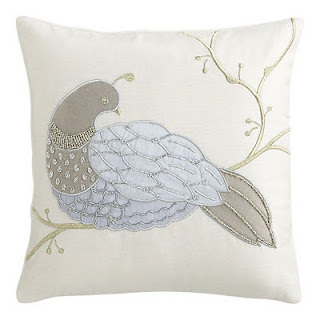 I hung it from a row of Basic Rhinestones and embellished it with them as well. I tied a Very Vanilla Taffeta Ribbon and adhered it to the top of the ornament. Easy Peasy. 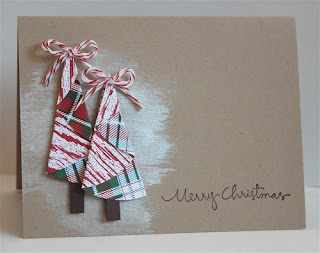 Do you still have holiday cards to make? Then head on over to The Outlawz and play along. I'll be back here tomorrow to post The Outlawz CAS challenge. So, make sure you come back! Happy Friday all!!! Although it was a short week, it felt really long. I'm so glad it's the weekend! 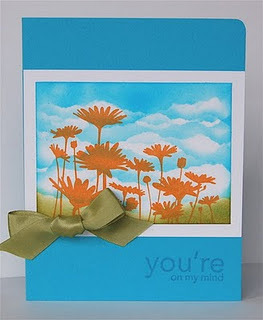 This card is a CASE of a members card on StampNation. We recently started a "Consider it CASEd" thread and it's a hit. 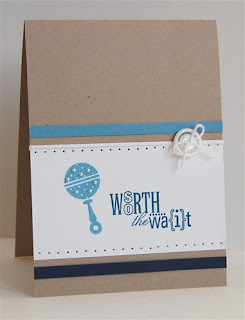 CASEing (Copy And Share Everything) others cards is a great way to grow as a stamper! I had never thought to put Dasher in the woods & I love it!!!! 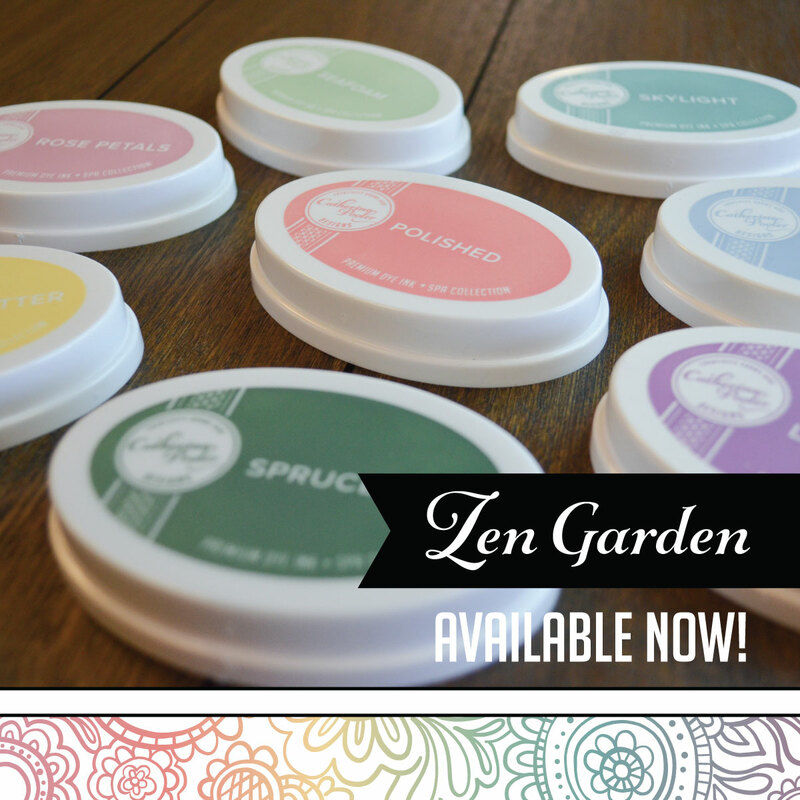 I changed the layout slightly, but kept pretty close to the original colors & design. 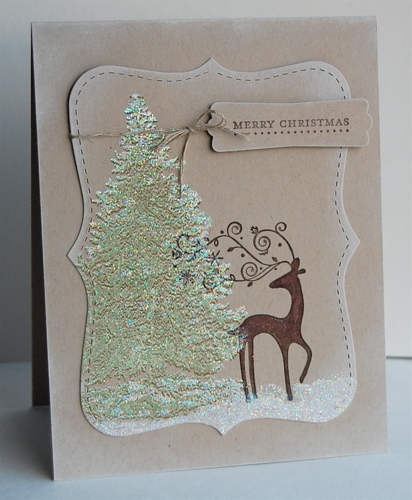 I started by stamping the tree from Christmas Lodge in Old Olive and then immediately stamped it again in white craft ink. It gave the tree a frosted, almost snow covered look. 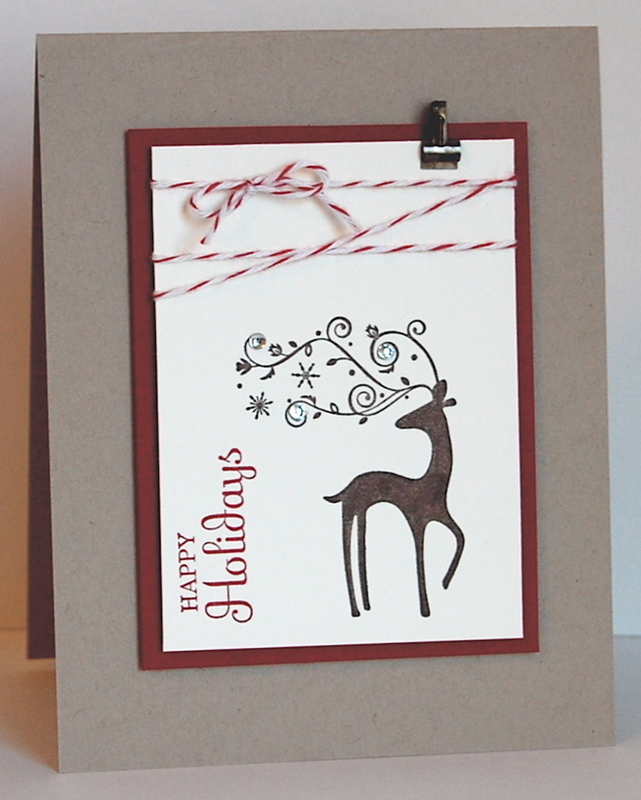 Then I stamped Dasher and did sponging sponging around the Top Note and cardbase. Lastly I add some Dazzling Diamonds. 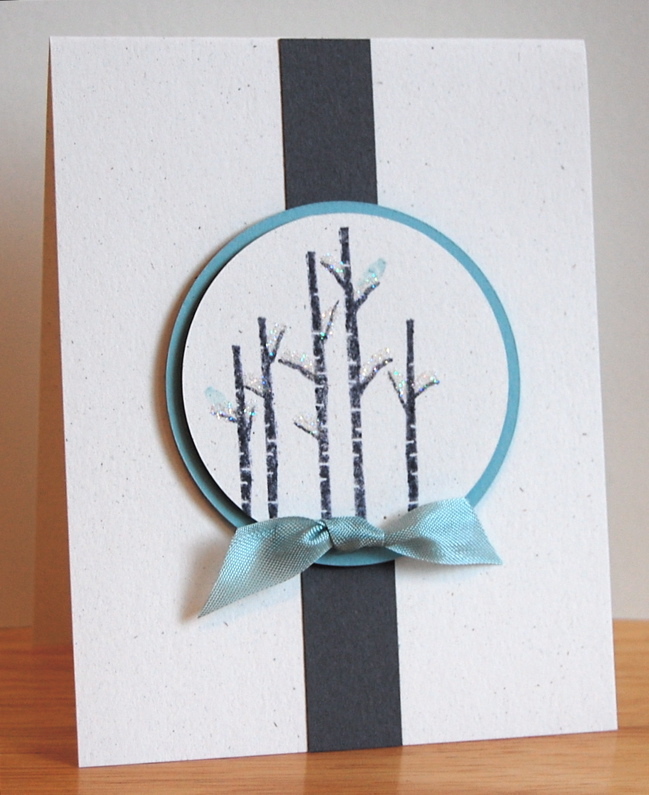 You can't have a snowy forest without snow, right? I have had my eye on this sweet stamp for a long time, Dasher by Stampin' Up! But somehow he has never made it onto an order. Luckily, my friend purchased him and I got to play with him yesterday! Don't you just love his scrolly antlers?! My card design was inspired by the SCS Sketch Challenge (SC361). 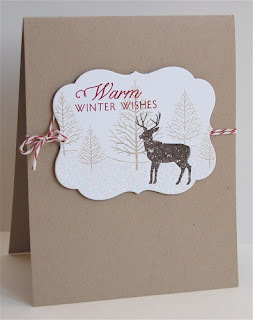 I used some scraps of the Frostwood Lodge dsp and Dasher inked up in Early Espresso. Then I tied a mini jingle bell with some bakers twine and wa-la, finito!